Group Present Pavilion With New Vacuum! 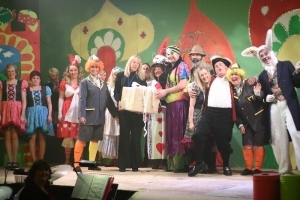 Hailsham Theatres have been lucky enough to perform the annual pantomime in Hailsham Pavilion since “Frankenstein” in 2005. Each year we kit out the Pavilion with our own stage extensions and set, have pyrotechnics, lighting and sound equipment installed, not to mention we have a sell out audience for most shows! As you can imagine this can make quite a mess! In the interval of the last show, Sarah Widdas, chairperson of Hailsham Theatres presented the Pavilion with a brand new vacuum cleaner.